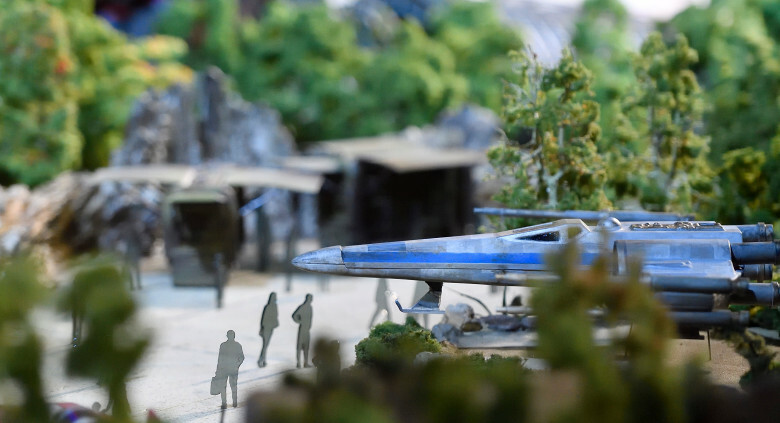 Disney Imagineering and Disney Parks released a huge model yesterday of the upcoming Star Wars land at both Disneyland and Walt Disney World (to which the name has also potentially been leaked as Galaxy’s Edge). And I do mean huge model – a full blown architectural model complete with silhouette people. 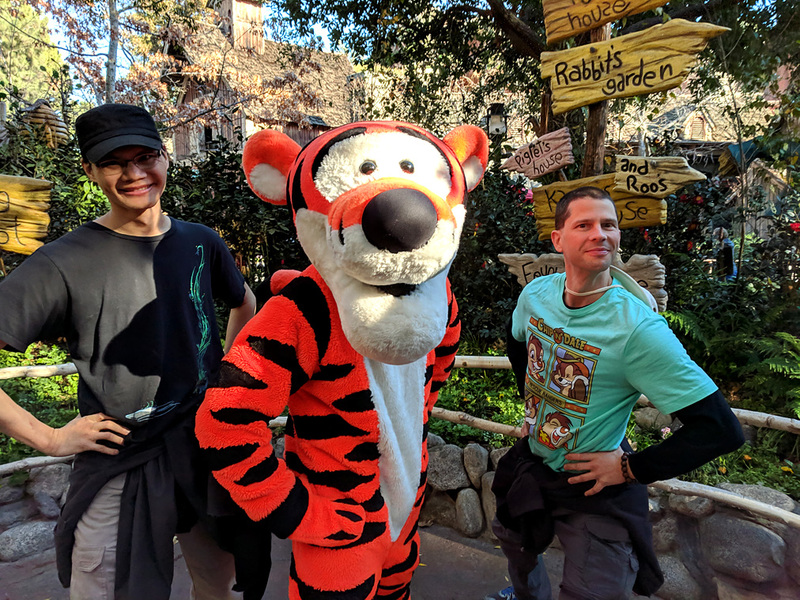 Quite frankly, it is crazy impressive, and it gives an amazing amount of insight into how the land will be designed (and how far they have to go to complete it, judging by looking at recent satellite imagery). 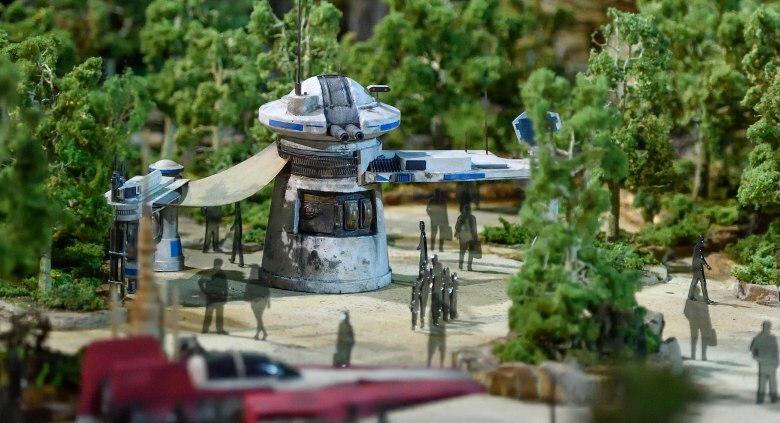 Seeing this model has me totally stoked – so much has been revealed! Let’s do the architectural deep dive! First and foremost, the baseline for all the buildings appears to be around 3-4 stories tall. These are not small at all, and walking down the streets and alleys will feel very canyonlike. The streets are also twist and kink. 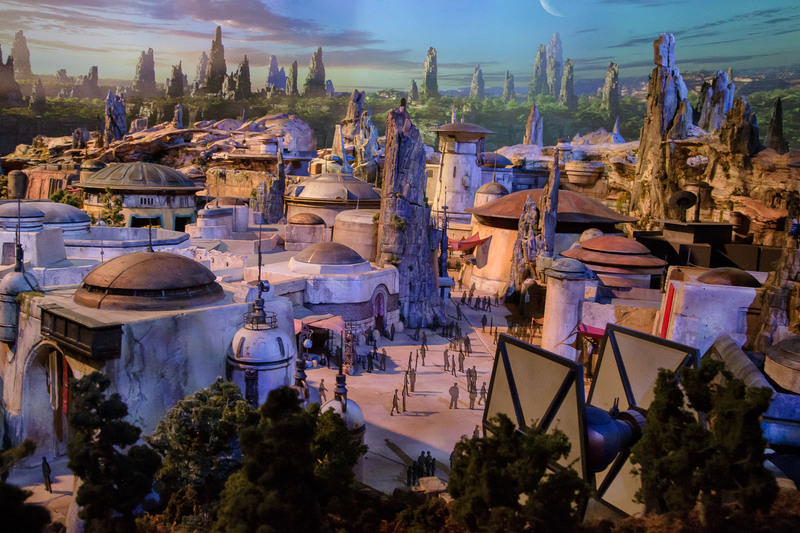 Not only does this mean you won’t be able to see out of the area, thus cementing the magic and immersion, but it also, quite significantly, means that you also won’t be able to see most of the rest of the Star Wars area either. 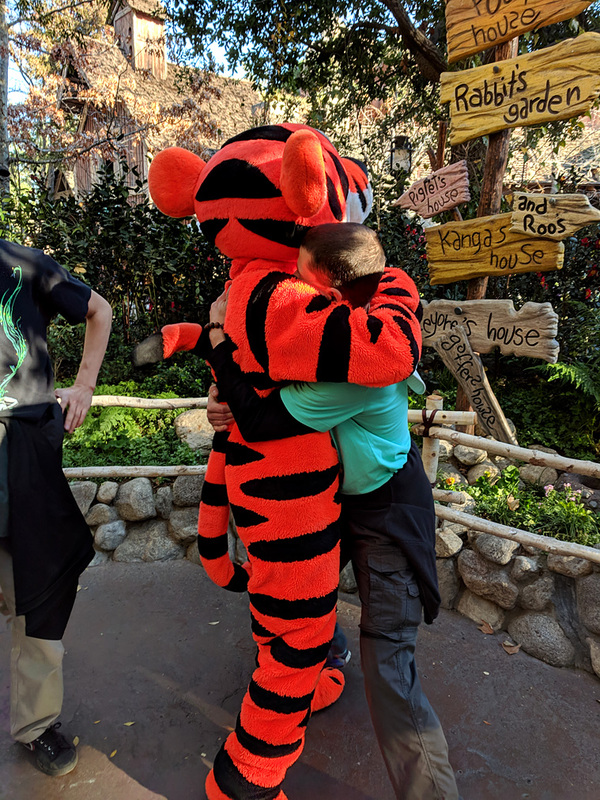 Which in turns means you’ll never get a reference for scale which will make the park feel larger than it is as you walk and explore all over. 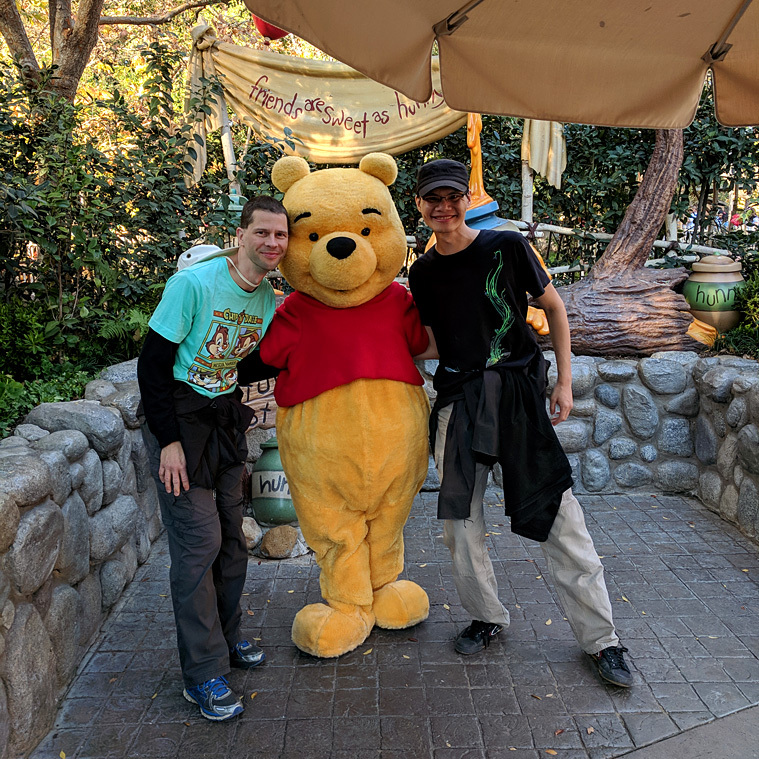 This is very different than many of the other areas at Disney. Because you can’t see one street over, and you’ll rarely get a “down the street” look, coupled with the fact that there is so much detail and little alleyways and alcoves and they are probably littered with little interactive moments, this thing is going to feel huge. The only area where you have a straight sightline will be the Resistance (though I’ll call it Rebel area, I’m oldschool) camp. 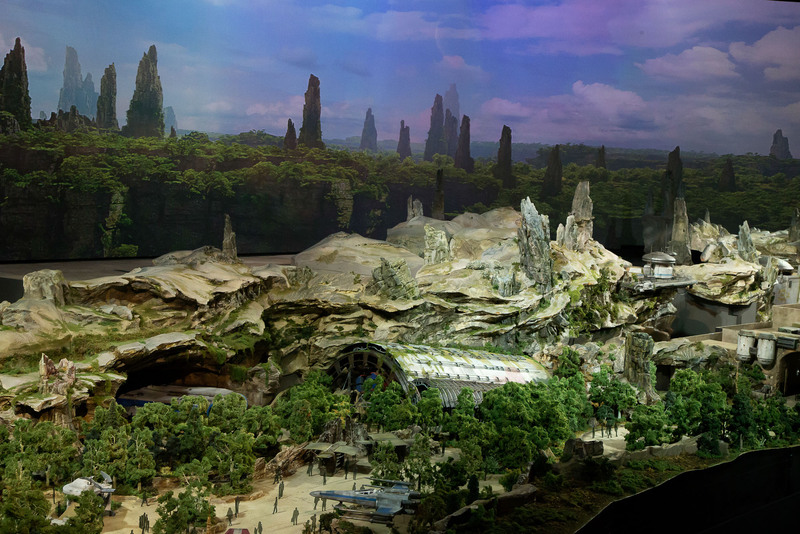 This in of itself is an unexpected twist, a forested area that’s separate from the starport area. We’re getting two new themed lands in one! Back to the buildings, making them so tall also means they have plenty of room for second or even third floors. 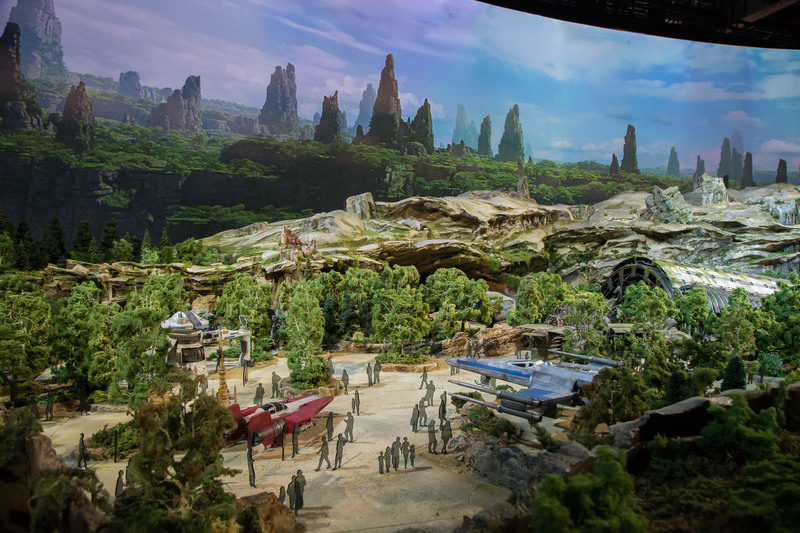 I’d wager most of this will be taken up for “backstage” areas – one of the most exciting things about this new Star Wars land is that there will be no Disney castmembers within it, or, more precisely, every single castmember will be “in costume”. 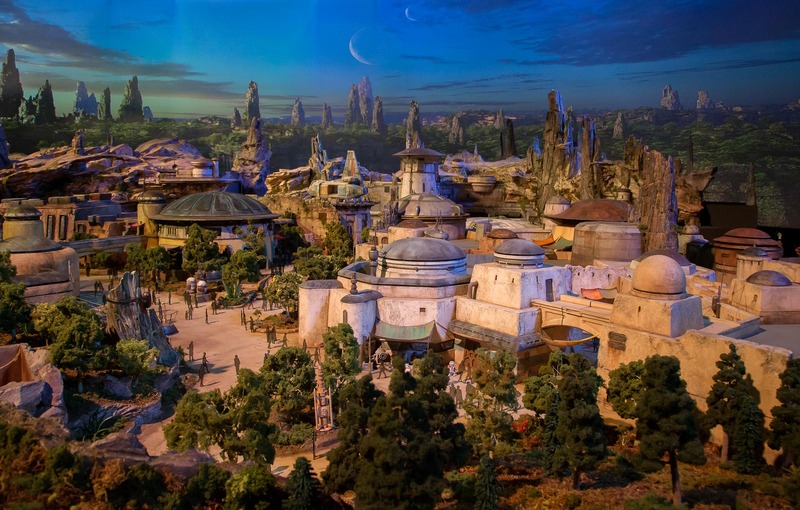 It is a 100% role playing area, and so if you go to buy a drink, you’re not buying it from a Disney uniformed member in some themed restaurant, you are buying it from Grubarsh the Jenet from their cantina. 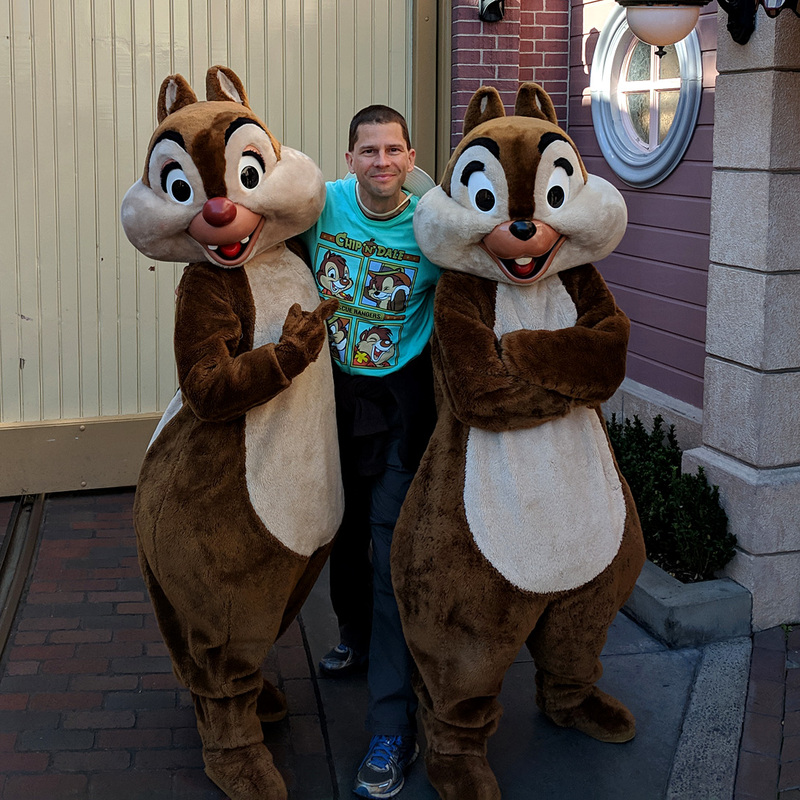 It’s all RP, all the time, and they are going to need a lot of backstage areas for members to costume up, rest, and travel to and fro without being seen “out of character”. That said, there’s a lot of second story area, and they could potentially put some attractions up there and grow the amount of content in the land without growing its footprint. The next most interesting thing for me is all that rock. 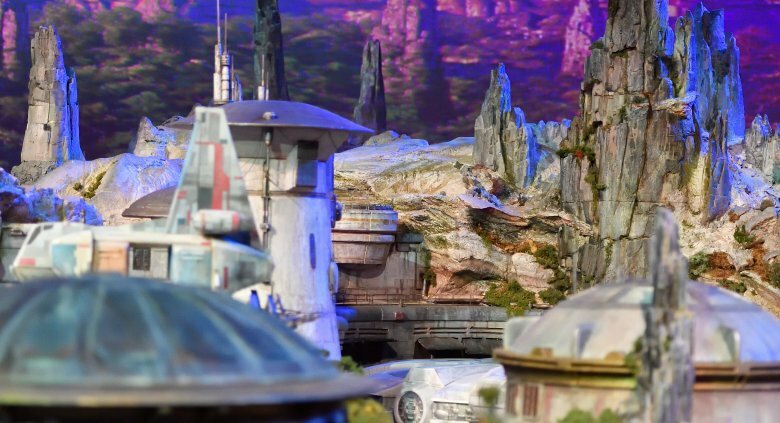 Hiding the large rides – Battle Escape and the Millennium Falcon ride – behind rock faces is a great way to keep what amount to very large buildings from breaking up the ramshackle small-scale feel of all the rest of the starport buildings. It also creates a very strong edge that’ll help in the feeling of a cramped starport, nestled up as much as it can to a natural boundary. 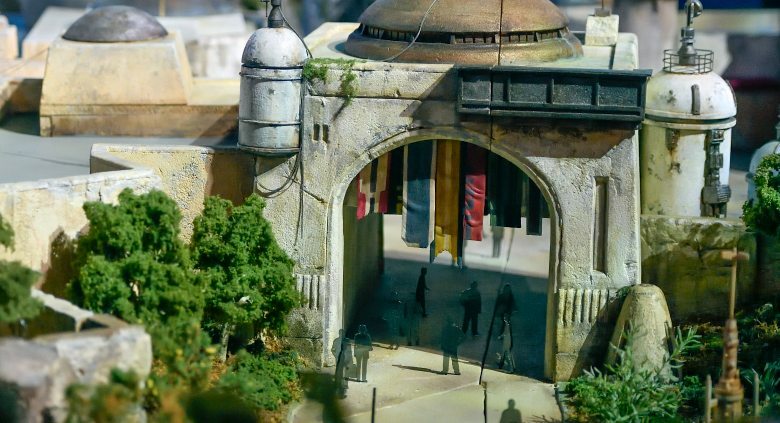 And then there are all those spires – if the scale of everything within that model is accurate, those are some very tall spires, tall enough they’ll likely match the Matterhorn and Big Thunder Mountain Railroad, out rivaling the height of the castle. From outside the land those spires will be very visible. 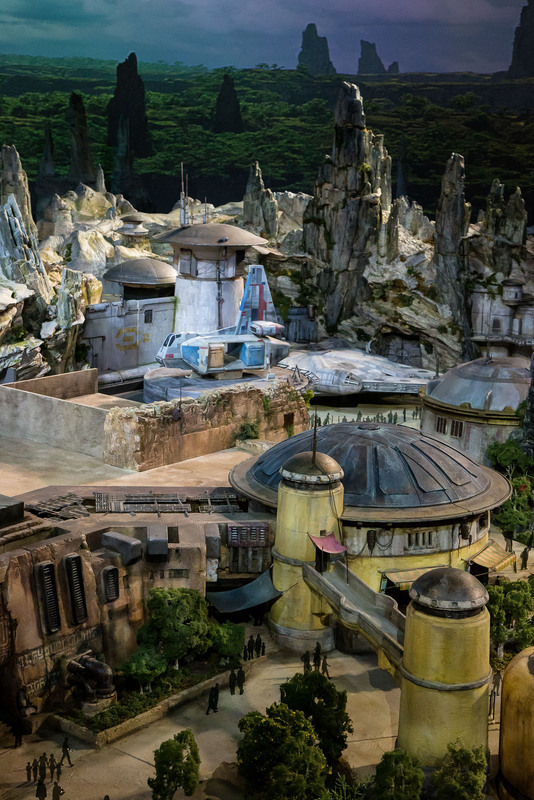 While Galaxy’s Edge is very well designed to be isolated visually (and thematically) from within the rest of the park (and, as noted above, vice-versa), these rock spires break that isolation enough to be a calling card. There’s so many fun details to explore in this model, which bodes well for the real thing. This is going to be a blast to be in, totally immersive, with so much to discover. Plus they’re talking about tracking visitors real time through “Galaxy Credits”, so that your actions on rides (such as how well you pilot the Millennium Falcon) and interactions with the denizens of the starport and the Resistance base will influence how your subsequent interactions will go. This sounds amazing (and a bit creepy! ), and will mark a very different park going experience, one of being a participant and character rather than an idle spectator. Very cool. Now all we have to do is wait two years for it to open. Photos sourced from the following, check them out for additional coverage including videos of the model! 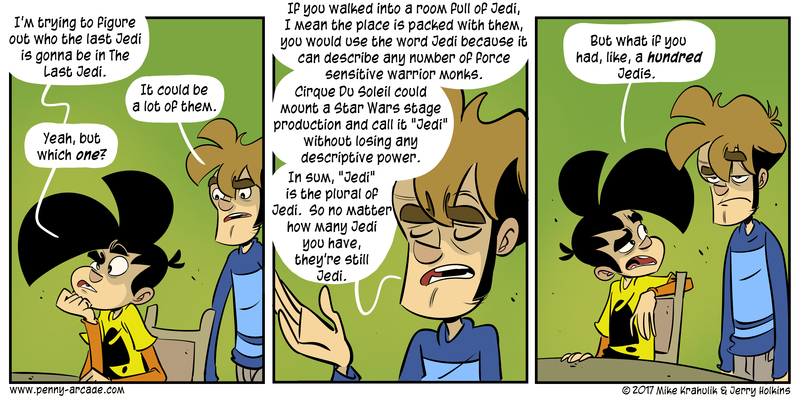 AND I CANNOT GET OUT OF MY HEAD THE VISION OF A CIRQUE DU SOLEIL PRODUCED JEDI SHOW.